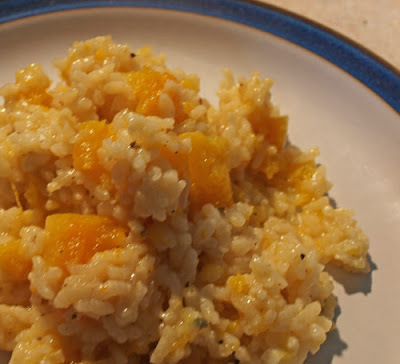 I got this cookery book last week and as well as being full of lovely cakes and pies, it also has some savoury dishes in it and one that caught my eye was this Butternut Squash Risotto. 1. Preheat the oven to 180C (350F), Gas mark 4. 2. Heat the olive oil in an ovenproof saucepan or deep ovenproof frying pan set over a low-medium heat, ad the onion and garlic, cover and cook for 8-10 minutes until soft. 3. 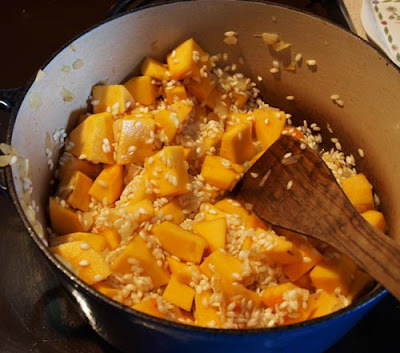 Add the cubed butternut squash and the rice and stir for 1 minute before adding the white win. Allow the wine to bubble, uncovered, for 1-2 minutes until it has evaporated, then add the stock and bring to the boil. 4. Season with salt and pepper, cover and cook in the oven for 12-15 minutes or until the rice is just cooked, with the tiniest bit of bite (it should not be soft and mushy), and has absorbed the stock. Add the grated cheese and chopped sage and season to taste. 5. Serve on warmed plates or in warmed bowls sprinkled with shavings of cheese and toasted pumpkin seeds. We had it for supper tonight and it was really delicious. You may have noticed that there are no shavings of parmesan or toasted pumpkin seeds, I'm sure they would add a little something to the dish, particularly in terms of presentation, but the dish stands up well without them. I love butternut squash, and it looks wonderful in this dish. 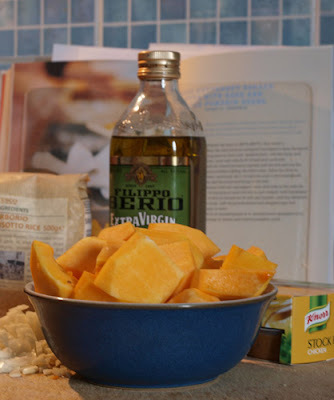 Nothing says Autumn to me like butternut squash! This recipe sounds wonderful. I'll give it a try. 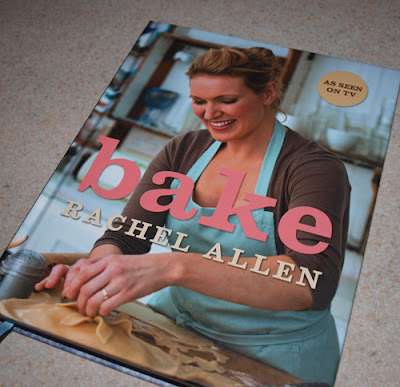 I have the same book & I love Rachel's recipes!! I made this recipe before & I loved everything about it!! I crumbled a little crispy smoked bacon (streaky) onto it instead of parmesan and it gave it another texture and flavour......lovely ! Great idea Pete, glad you enjoyed the risotto. I have this cook book too and made this risotto last night. I added about 2 cups of frozen peas half way through cooking which added a bit of colour. I served with some crispy smoked bacon and fried sage leaves on top. Delicious.